Obituary – Franklin, Dora Lee (Crockett) « Perry High School Alumni Association, Inc.
Class Assembly 49-50, Glee Club 49-51. ﻿Dora Lee (Crockett) Franklin, 65, east of Perry, died Sunday, Nov. 28, 1999 at Stillwater Medical Center. Funeral will be at 2 p.m. Wednesday, Dec. 1, 1999 at Christ Lutheran Church in Perry. Rev. Myron C. Maltz, pastor, will officiate. Burial will be in the Richburg Cemetery, southeast of Perry, under the direction of Brown, Sisson Funeral Home. Memorials may be made to the Oklahoma Medical Research Foundation designated for cancer research or the Murl Franklin account at Morrison State Bank. Mrs. Franklin was born June 15, 1934 in Perry, OK, the daughter of Ernest C. and Mary Marguerite (Atherton) Crockett. She was a 1953 graduate of Perry High School. She and Murl Franklin were married on Feb. 13, 1955 at Christ Lutheran Church in Perry. A housewife, she had served on the voter registration board and was a member of the Christ Lutheran Church. 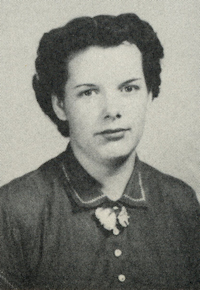 In addition to her husband, Murl, of the home; she is survived by three sons and daughters-in-law: Jimmie and Kathy Franklin, Glencoe, David M. and Paula Franklin, Stillwater, and Kelly D. and Tammy Franklin, Perry; two daughters and sons-in-law: Debra L and Vernon Bay, and Kimberly A. and Doug Connell, all of Perry; 17 grandchildren, and six great grandchildren; one sister, LaDean Webb, Morrison; and two brothers: Bill Crockett, Leadville, CO, and Rev. Dell Crockett, St. Louis, MO. She was preceded in death by her parents and three sisters, Carol Ann Richardson, Mae Tubbs and Eula Karcher.